This example demonstrates the use of PROC NETDRAW for a nonstandard application. 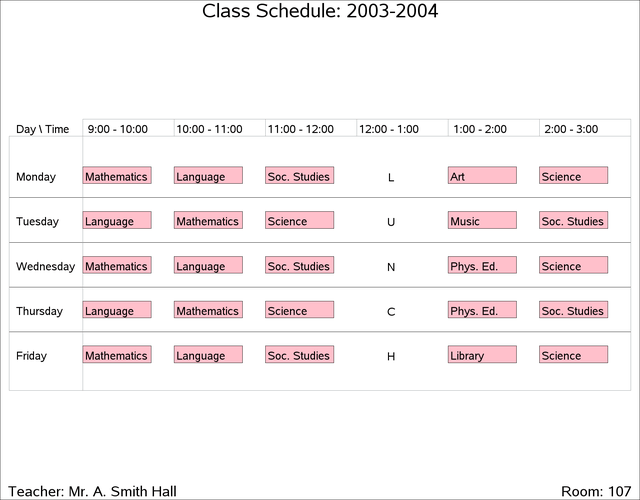 The procedure is used to draw a time table for a class of students. The days of the week are treated as different zones, and the times within a day are treated as different values of an alignment variable. The following DATA step defines a total of twenty activities, 'm1', …,'f5', which refer to the five different periods for the five different days of the week. The variable class contains the name of the subject taught in the corresponding period and day. Note that the periods are taught during the hours 1, 2, 3, 5, and 6; the fourth hour is set aside for lunch. The time axis is labeled with the format CLASSTIM, which is defined using PROC FORMAT. The USEFORMAT option in the ACTNET statement instructs PROC NETDRAW to use the explicit format specified for the time variable rather than the default format. This example also illustrates the use of the Annotate facility with PROC NETDRAW. The data set ANNO labels the fourth period 'LUNCH.' The positions for the text are specified using data coordinates that refer to the (_X_, _Y_) grid used by PROC NETDRAW. Thus, for example X = '4' identifies the x coordinate for the annotated text to be the fourth period, and the y coordinates are set appropriately. The resulting time table is shown in Output 9.16.1. Monday     Mathematics    1   m1   . Monday     Language       2   m2   . Monday     Soc. Studies   3   m3   . Monday     Art            5   m4   . Monday     Science        6   m5   . Tuesday    Language       1   t1   . Tuesday    Mathematics    2   t2   . Tuesday    Science        3   t3   . Tuesday    Music          5   t4   . Tuesday    Soc. Studies   6   t5   . Wednesday  Mathematics    1   w1   . Wednesday  Language       2   w2   . Wednesday  Soc. Studies   3   w3   . Wednesday  Phys. Ed. 5   w4   . Wednesday  Science        6   w5   . Thursday   Language       1   th1  . Thursday   Mathematics    2   th2  . Thursday   Science        3   th3  . Thursday   Phys. Ed. 5   th4  . Thursday   Soc. Studies   6   th5  . Friday     Mathematics    1   f1   . Friday     Language       2   f2   . Friday     Soc. Studies   3   f3   . Friday     Library        5   f4   . Friday     Science        6   f5   .